Quick update as I begin the roof-to-beltline painting of marine epoxy high gloss white on The Ghost. This will MASSIVELY help with interior thermal management and also with cleaning/etc. For perspective, the gray roof gets so hot in full sun that I cannot hold my hand to it (120F+). The white roof on the Volkswagen Riveria nearby (same paint) is ambient (80-85F) temperature when touched in the same sun. The paint I’m using is Petit brand Easypoxy High Gloss White. It’s not cheap, but with a Port Supply account and some wheeling and dealing, I can get it about 1/2 price (gallon can retails over $120). It is deigned for boat top-side paint. It has to be applied in 2-3 thin coats over a few days for the finish to fully cure and be rock hard. This stuff is highly recommended if you have metal/wood/fiberglass that you want to seal/cover. Preparation for paint involves a pneumatic disk sander (for auto body work) and some medium grit disks. I’m also wire brushing all loose flakes/spots off before a good blast with pressure air to clean. I’m simply foam/bristle brushing it on and will low nap roller it on once I hit the large open areas. 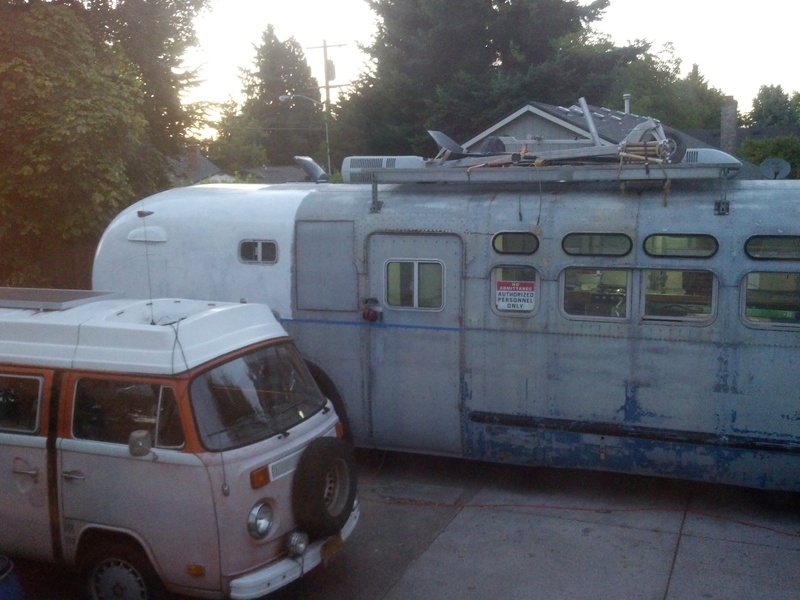 I will be doing the whole length of the bus in this to the beltline to start the paint match to the original delivered color scheme (white, navy blue stripe, gray below). It should make things much cooler in the desert when done. Thanks for checkin’ in!